You don’t have to be a competitive bench rest shooter to want to get near bench rest rifle accuracy from your hunting rifle. However, when we are reloading for a hunting rifle we have to make some compromises between obtaining the absolute best accuracy we can get and the function of our reloaded ammunition in our rifle. That reloaded hunting rifle ammunition has to function reliably whether It’s winter with snow on the ground or the height of summer with temperatures in the 40 degrees Celsius (104 degrees Fahrenheit) range and all the shades in between. Since reloading for a hunting rifle and reloading for a bench rest rifle are similar but different how we tackle achieving the best results in each are a bit different. But to get the best accuracy in our hunting rifle it pays us to use some bench rest tools and methods. Hunting rifle reloads almost always require full length resizing. The only time this may not be true is for a specialist application such as long range varmint sniping or similar. But for the deer rifle, the wild boar rifle and of course for anything that might just need to be used on something dangerous the cases need to be full length sized and checked to ensure they actually function with complete reliability in the rifle. It is with bullet seating however that we can make a serious contribution to achieving optimum accuracy. One of the key factors in achieving accuracy is to create cartridges that have the highest level of concentricity. The main way to achieve that is to ensure the bullet is seated concentrically in the cartridge case, and for that we need a “bench rest” style of bullet seating die. 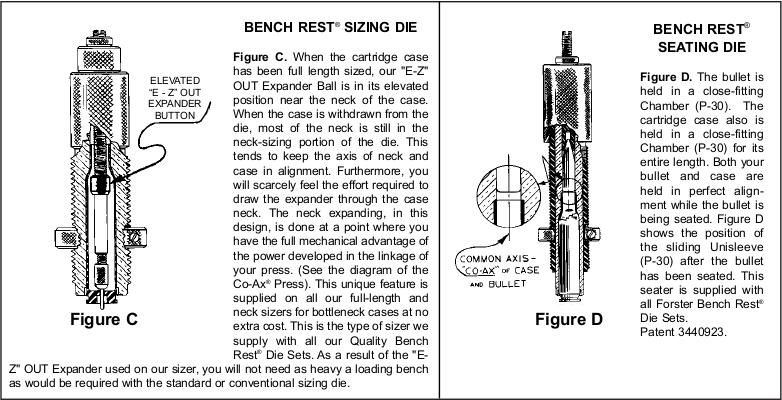 As can be seen in the diagram on the right the bench rest seating die has an internal sliding sleeve to align the bullet before it is pressed into the cartridge case mount. (Picture courtesy Forster). 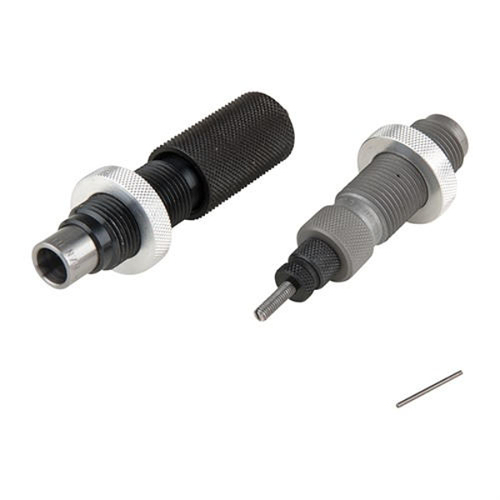 A bench rest bullet seating die commonly contains an internal sliding sleeve which serves to align the bullet with maximum concentricity before it is pressed into the cartridge case mount. This single feature makes a big contribution to achieving the best concentricity of completed cartridge, and that concentricity means accuracy has to be much better than it otherwise would be. The operation of the bullet seating die is described and illustrated in the diagram on the right. (Picture courtesy Forster). So if you are loading for a hunting rifle and looking for the best solution to achieving peak accuracy then the Forster full length size and bench rest seating die set is one of the best investments you could make. 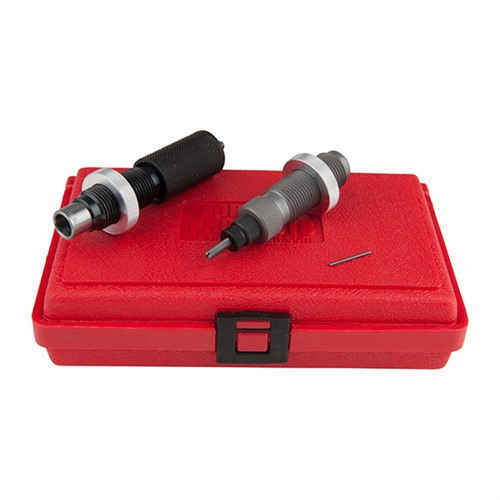 The sets are simple, affordable, and coming from Forster are of the best quality you could hope for. In addition to these die sets being affordable and excellent they are also available in a wide range of calibres including some of the harder to get metrics such as the 6.5×57, 7×64 Brenneke, and 8x68S in addition to being available for the .338 Lapua Magnum and the .375 Holland and Holland Magnum and other more common calibres. You can find Forster full length size and bench rest seating die sets at Brownells at very reasonable prices if you click here. Just because you’re not shooting competitive bench rest does not mean you don’t deserve the closest you can get to bench rest accuracy from your hunting rifle. With the Forster full length sizing and bench rest seating die set you can make a big move towards achieving the best accuracy your rifle is capable of . You’ll find the full instructions for the Forster full length sizing and bench rest seating dies in downloadable PDF format on Forster’s web site if you click here. The Forster full length sizing and bench rest seating die set comes in a sturdy plastic storage box. (Picture courtesy Brownells).